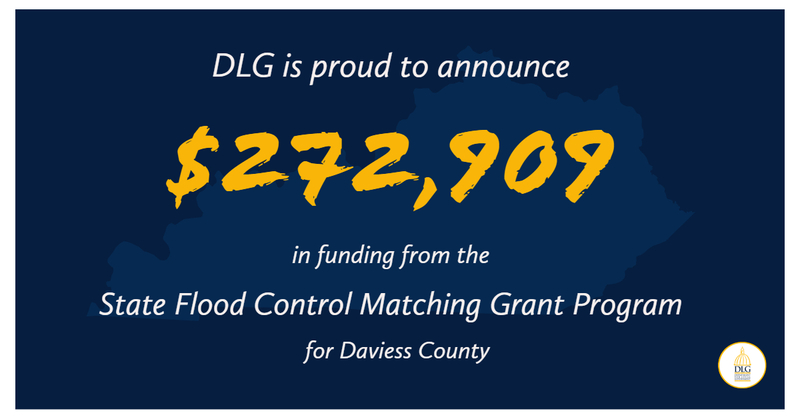 FRANKFORT, Ky. (December 14, 2018) – The Department for Local Government (DLG) has announced a $272,909 grant from the Flood Control Matching Grant Program to Daviess County Fiscal Court. The funding effort will allow the county to acquire and demolish 10 homes on Wyndcrest Drive that are prone to flooding. On average, Wyndcrest Drive floods two or more times a year, submerging homes in several feet of water. This causes delayed emergency responder access and difficulties for residents. The total project cost is expected to be $1.4 million, with multiple agencies providing funds. For the Daviess County project, FEMA is contributing $830,388; Kentucky Emergency Management is contributing $176,527 and Daviess County Fiscal Court is contributing $191,238.